Something I cherish in life is quality time with my sister. Because of our crazy lives, our off times rarely cross, but when they do, it's a time for both of us to take a short breather and sit back while enjoying something we both love. Luckily, we both had a night off for my birthday, so we decided to eat out and go back to our music roots by enjoying some classical music. We had an amazing dinner at The Gage and listened to the CSO perform Beethoven 9 conducted by Muti. So perfect! Just the relaxing night we both needed. 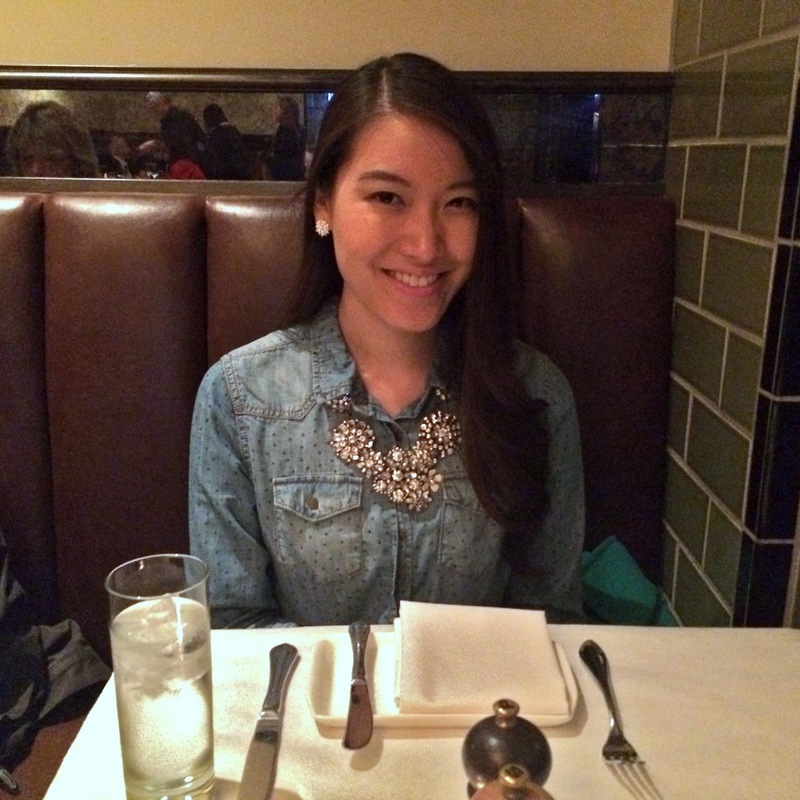 It was our first time dining at The Gage and I absolutely loved it. Everyone was so friendly and the service was impeccable. They truly know how to make their customers happy. The moment, we sat down, I knew we would have a great experience! The Caesar Salad is probably the best I've ever eaten. I don't know what they put in the dressing, but it's pretty magical. 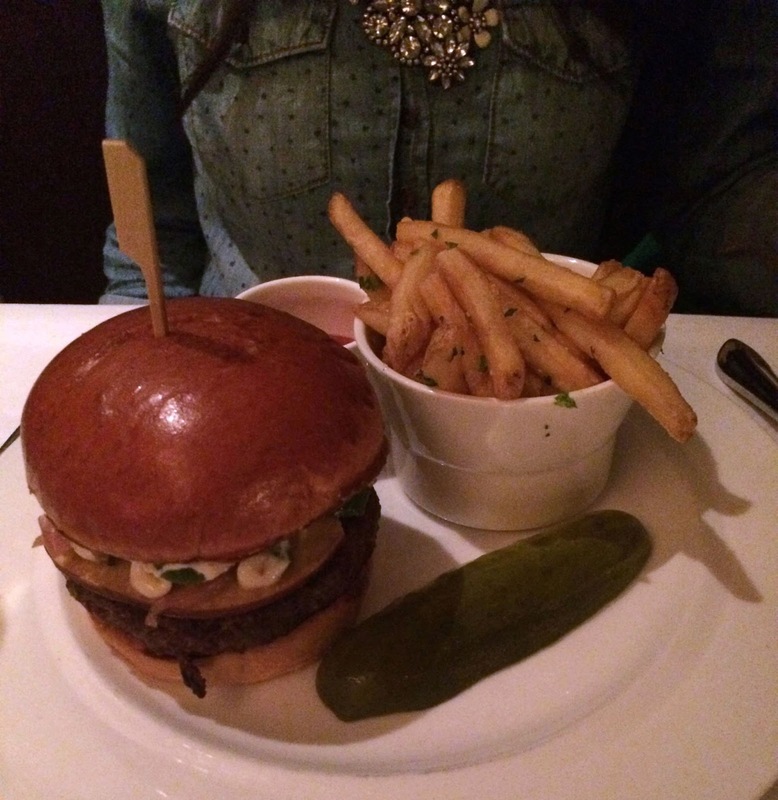 And the Venison Burger was amazing! Pretty close to perfection. I loved the addition of jalapeños, it was a tasty surprise. I found out that the lady at the table next to us was celebrating her birthday as well and she shared a piece of her delicious cake with me!! Serendipitous & sweet! Then, our awesome waiter also brought me a Peanut Butter French Silk Pie and sang Happy Birthday to me! It was amazeballs. So smooth & the peanut brittle was yummy! I wish I was hungry enough to try the rest of their desserts. Now on to that night's look. I'm loving the trend of florals in Fall and full skirts. 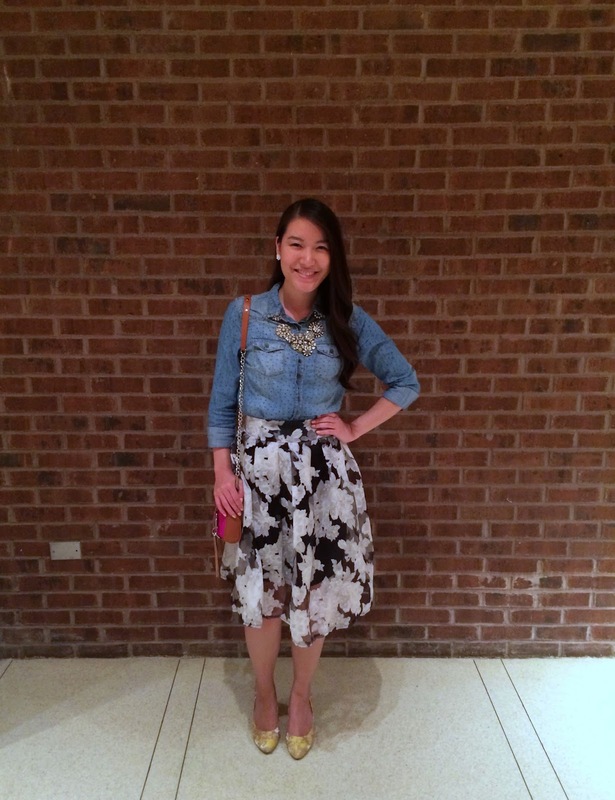 For the night out, I wanted to wear a full floral midi skirt that I shared about in my Hong Kong style haul. However, I didn't want it to be too dressy, so I dressed it down with a chambray shirt. But it looked a bit too casual for the symphony, so I dressed it back up a bit with a favorite statement necklace from Benevolent Jewels. It's all about getting that perfect balance! With practice, you can become fluent in utilizing what's already in your closet to dress for any occasion. Similar to how I styled this outfit, I typically start with the focal piece and add items to the outfit one by one. Here are some details of both of our outfits. My sister wore an Anthropologie dress with a Kate Spade crossbody. My gorgeous shoes are Seychelles and I paired them with my new favorite Rebecca Minkoff Mini Mac bag that I scored for a ridiculously affordable price at TJMaxx! Don't forget that you can score yourself a pretty statement necklace like this one and many others at Benevolent Jewels for 20% off with the code JHCODE20! It's the best "investment" I've made since it has a classic look and can be paired with many different outfits! Thanks for reading this story! I hope you all have a lovely week filled with smiles and joy! Be grace-filled to pour out grace to others & wear the kind of love that changes lives for the better. 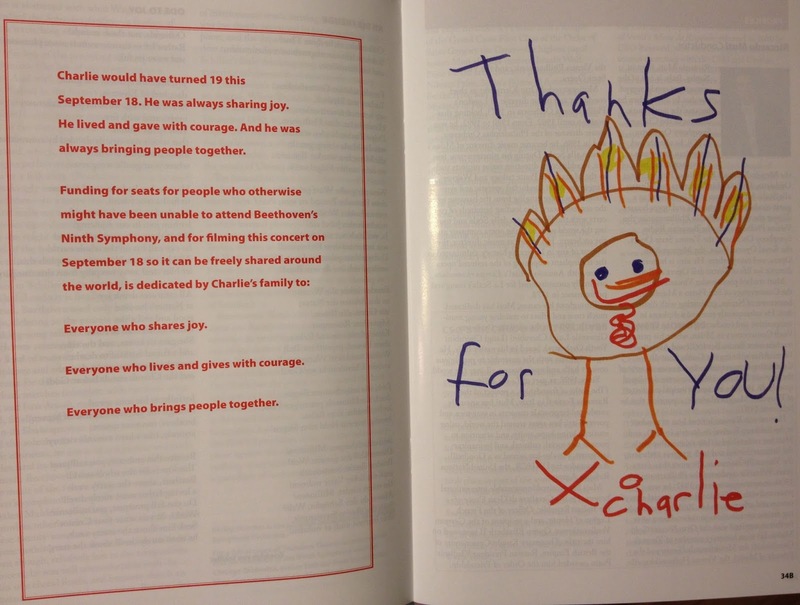 Something that was in the CSO program book was this sweet hand-drawn picture from a boy named Charlie. I am so honored to share a birthday with him! Let's share joy, live and give with courage and bring people together! Thanks Ada!! :) I always love your looks! Sounds like the perfect evening! I haven't been to The Gage yet but everything sounds delicious. What a gorgeous outfit! Love your skirt and those shoes! absolutely adore the skirt! you are the sweetest! what a lovely birthday, I am jealous of such a pretty floral skirt almost as much as that pie. Such a cute skirt!! Happy belated birthday, and thank you for the comment on my blog! Looks like you had a great time. I love your stunning skirt, you look great. Cute skirt! And it sound like you and your sister had a great time. So glad you had an awesome birthday! 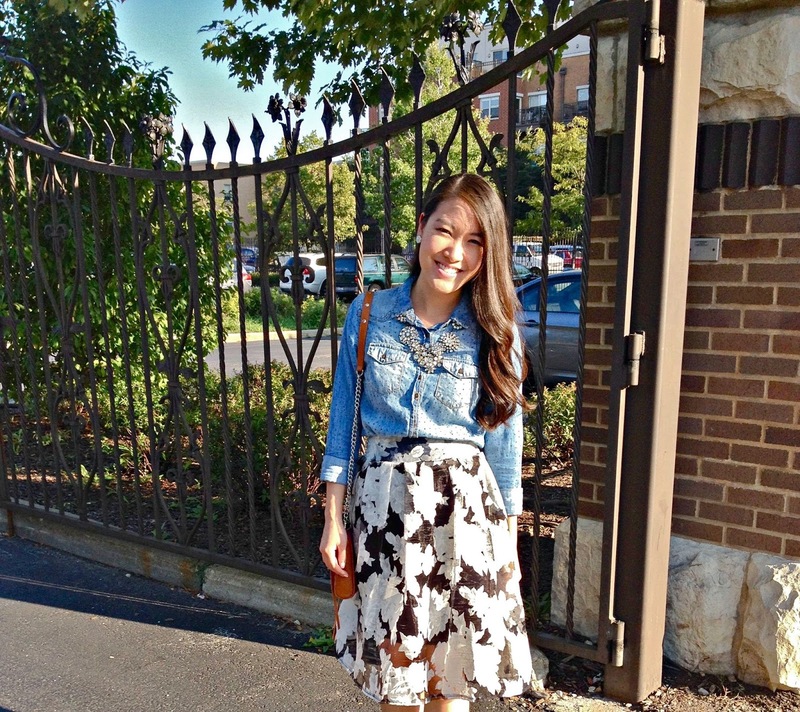 Love the way you styled your chambray skirt with a flirty, floral skirt. Definitely going to need to try that one day! I hope you do try it!! Be sure to share a picture so I can see it :) Thanks for stopping by!! Sounds like the perfect sister-date! And I LOVE your skirt!! Most definitely :) Thanks so much! Seychelles makes THE best shoes! Such a cute outfit. And Happy Birthday!! 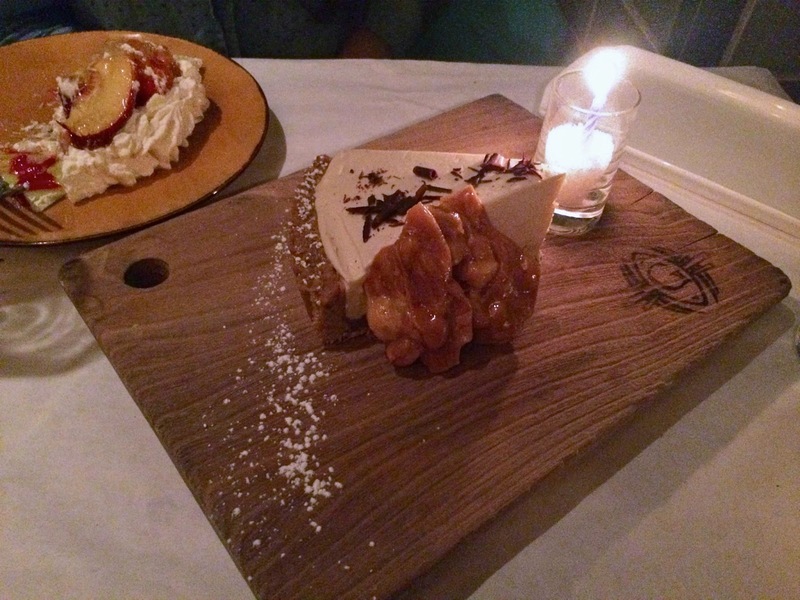 Classical music (and that delicious dinner) are great ways to celebrate! I agree!! I'm obsessed with all their shoes! It's become my weakness ;-) Thanks so much Ashley! You are making hungry! The food looks incredible. What a perfect birthday! Oh and your outfit is perfect. I love the skirt so much! It really was a perfect day :) Thanks so much for the kind words!! cute outfit!! 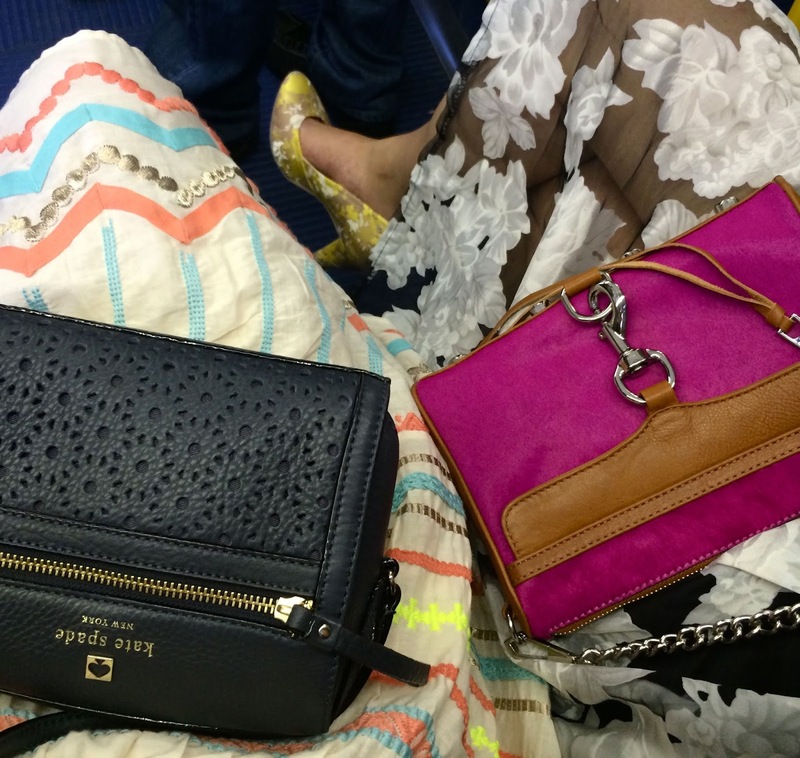 I absolutely love your minkoff and kate spade crossbody bags!! now Im gonna keep thinking about these two hahaha! you had an awesome birthday! You should get them!! I don't think these exact two are available anymore (they literally all just sold out! ), but I shared some similar options in the post! :) Thanks Uris! Everything about this post is fabulous! I love hearing about your night with your sister. That is so special and the picture of your purses and skirts is so pretty! Love it. 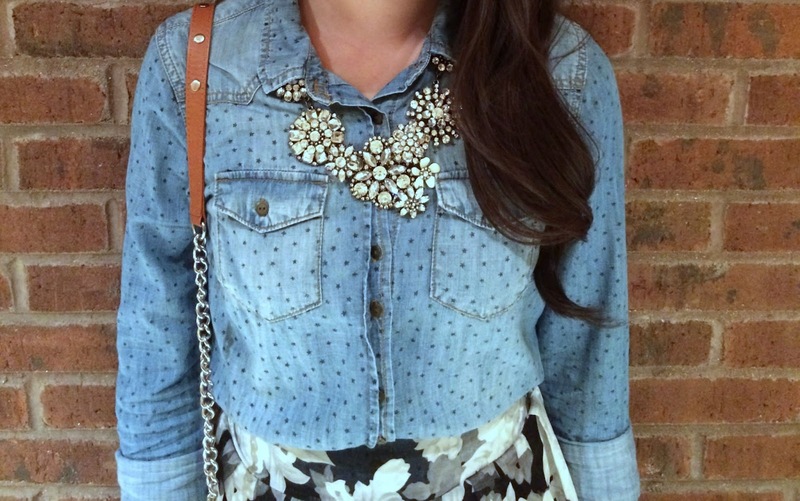 That statement necklace is gorgeous, you've styled the hwole outfit perfectly! Love your entire outfit from head to toe! Very stylish indeed. Sister time is always good. Such a lovely look! 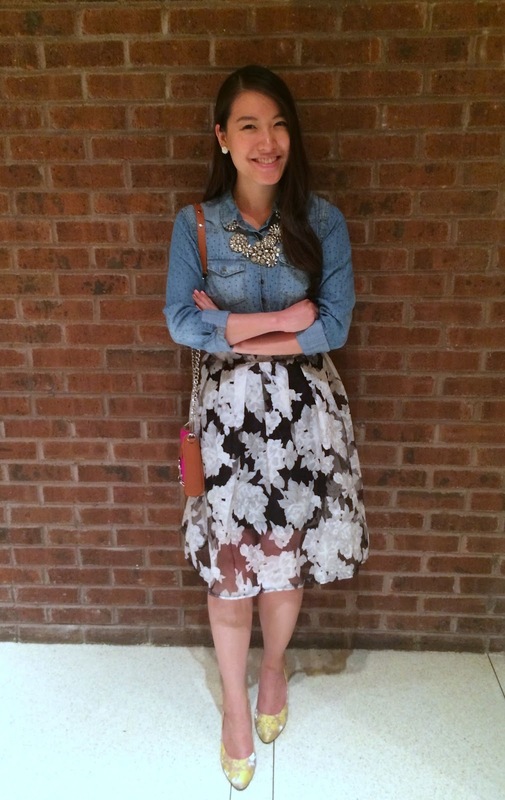 Your floral skirt looks fab with your chambray top and gorgeous necklace. sounds like a wonderful way to spend your birthday! When I saw it, I was like...this must be meant to be! ;-) Yea, it's a hit or miss at different stores. Lovely outfit - love the statement necklace!! Thanks so much! It's a favorite! i love your necklace. I love chunky statement necklaces. I adore your skirt, and that lovely statement necklace! Sounds like a great way to celebrate your birthday. Love that floral skirt - stunning!! Thank you for joining TBT Fashion link up and I hope to see you this Thursday. Both of those bags are great! I really like your skirt, too. Looking stunning, adore your vintage style outfit! Love it all! Thanks for linking up to #fashionfriday. Please do link back or add my badge! I love the look--especially your shoes! I have the perfect outfit to go with them myself. Thank you for sharing! in love with this outfit and subtle mix of prints! so fab! and let's talk about those fries? YUM! The black sheer floral dress is absolutely gorgeous...so pretty in fact I'm heading over to Anthropology right now to grab one for myself! Great statement necklace! I love the denim paired with the floral. I love the skirt - and dinner looked divine! Gage, here I come! Gorgeous outfit! Hmmm, that food and cake look delicious!